The second quarter of 2014 is promising to be an exciting time for Android TV boxes based on Chinese SoCs with lots of announcements. Devices powered by Amlogic S802 quad core SoC such as M8 and Vega S89 are already available, Rockchip RK3288 Android TV boxes are likely to sell in May, together with AllWinner A80 development board and tablets, and Android media players probably coming to market in June or July. But Amlogic S802 is not the only new quad core processor announced by Amlogic, with S805 and S812 soon to be featured in HDMI TV sticks and TV boxes. Amlogic IP/OTT STB SoC page has a comparison table for their four STB SoC. Let’s go through this table to see which processor may better match different end-users requirements. First we’ll notice none of Amlogic SoCs feature SATA nor USB 3.0, so for those of you who require fast local storage transfer, you may be out of luck. 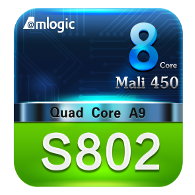 All of the new S80x SoCs come with Mali-450 GPUs so 3D graphics performance will be very good. Component video output support has been dropped from the new SoCs, probably because few people are still using YPbPr, with the vast majority of TV now supporting HDMI. H.264 1080p encoding is now supported, which , at least in theory, means you can do FHD video conferencing, something which was not possible with AML8726-MX (720p max). S812 and S805 are the only two SoCs in the table capable of supporting H.265/HEVC videos in respectively 4K and 1080p resolution, as well as Gigabit Ethernet. As fast I know MX only supports Android 4.2, but the latest S80x SoCs all support Android 4.4 Kitkat. 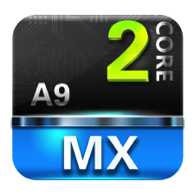 AML8726-MX – Good for 1080p video playback, and light Android usage. Proven design, cost effective (Full box with remote ~$70). Some hardware platforms support DVB-T(2), DVB-C, or DVB-S(2). S802 – Good for 1080p and 4K video playback. Excellent performance with a quad core processor, Octa core GPU. Could be also used as a pretty good gaming platform. No HEVC support. S812 – Same as S802 but adding H.265/HEVC video decoding up to 4K and Gigabit Ethernet. This makes it more future proof than S802, and it could potentially be used as a media center with a USB hard drive and Gigabit Ethernet connection. S805 – Upgrade for AML8726-MX with faster multi-core performance, better GPU, HEVC, 1080p H.264 video encoding, and Gigabit Ethernet. Apart from 4K support, it can do anything S812 does, so if you don’t need 4K video playback and output, this could be a cheaper solution. Power consumption should also be lower than to the Cortex A5 cores instead of Cortex A9 for the other SoCs.